There comes a time in every special needs family’s life when you realize… You have no idea what you are doing and parenting this child is not like parenting other children. The same rules don’t apply. Things you never thought you would do as a parent, like resorting to bribery on a constant basis, are now encouraged by therapists and books as a “token economy.” Things you just expected would be the case based on your child’s age just didn’t happen for him yet, his behaviors are out of control, and it’s causing problems. Every special needs parent I know will tell you the early days are the worst. Before you have a diagnosis but you know something is wrong. After you have a diagnosis and your head is spinning. You have no tribe yet and you are maybe just beginning to even find online communities you can turn to. You need some practical help, preferably yesterday. I’m no doctor or therapist. I’m just a mom with three years since my son’s diagnosis under my belt. Every child is different and I make no guarantees that these will work on your kid. But here are ten behavior hacks that have made a big difference for my son. 1. Figure out what he is worried about. Anxiety is a key feature of many emotional outbursts. My son used to cry and scream that he was starving. I assure you he has never missed a meal. One day I figured out that he needed to know when we were going to eat next. Once I explained that we were five minutes from home and he could have a sandwich right away, he stopped. When I asked my Facebook community what worked for them, Karin Lunsford had a similar experience. Her son was given a dollar as a pretty routine reward to play pinball. Even though he knew it was coming, he would sit there repeating the word dollar. Once she put a dollar in his pocket, even before they got to the pinball machine, he calmed down. 2. Know his limits. The more your child succeeds, the more he will continue to succeed. A premature erosion of self-confidence is pretty much standard-issue with a disability. I’m not suggesting the everybody gets a trophy approach, really I’m not. But if you are going out to dinner and you want your child to behave, pick an atmosphere where he can manage that. Think about sensory match – is your kid better in a quiet environment because he gets over-stimulated? Perhaps he is sensory seeking and if it is too quiet he will fix that problem. 3. Understand that behavior is communication. Kids with autism especially are going to have a hard time getting their point across sometimes. My son has a vocabulary in the 98% but he can’t tell you a story in chronological order. While he can sometimes be very insightful, sometimes he flips out for what seems like no reason at all. 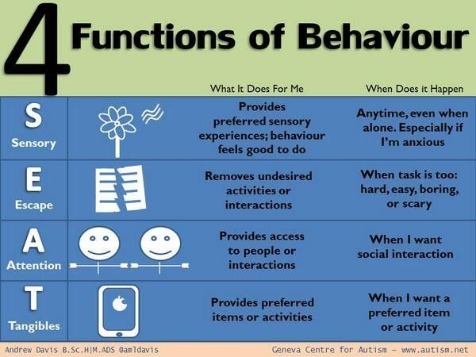 Despite the collective opinion of my son’s IEP team this last year to the contrary, behavior isn’t random and it isn’t always about seeking out attention. Generally speaking, there are four main functions of behavior: Sensory seeking, Escapism, Attention Seeking, and seeking access to Tangible materials, or SEAT for short. This is a hard one because to an outsider it can look overly permissive and giving in to bad behavior. But in truth this is a very challenging thing. You have to accept the fact that your child is trying to tell you something, and he probably wishes he could do it in a more productive way too. Then your compassion level goes up and you can take on the detective mission. This is what professionals do by the way, so hopefully you are on your way to getting help. It’s that hard. I say start with the simpler behaviors. Once you can figure out why, you are one step closer to giving them what they need. Even if it is attention-seeking, that means your child needs your attention. If you give it to him before he acts out in order to get it then he will act out less, trust you more, and feel less anxious. It’s hard for anyone to be rational when stress is overwhelming. ​4. Always be prepared. Sometimes life means you just aren’t going to be able to provide a calm, routine, predictable environment for your child. I’m super pro electronics. The iPod Touch has been nothing short of a lifesaver. I think I might be a recluse if not for it. It stops the echolalia while I attempt to drive on LA freeways. It keeps him quiet when I have to drag him along for a doctor appointment or there has been a family emergency or I need him to participate in a non-preferred activity. That’s life. Life isn’t perfect. Disability or not, our kids need to learn this as much as anyone else. But you have to help them through it. If your kid is sensitive to noise, maybe some noise cancelling headphones are a good idea while you are schlepping around. Maybe it’s art supplies, or a book on bugs or trains or dinosaurs. Just have the thing that helps them deal with the occasional speed bump. It’s ok if they need a crutch while they learn to do what may come more easily to others. 5. Celebrate incremental success. There is a phrase that always seems to get attached to IEP goals that I find helpful: with 80% accuracy. Don’t let the perfect be the enemy of the good. Tiger moms, helicopter parents, perfectionists – YOU adapt. Now. My son pees on the toilet seat. It drives me insane. Before I learned some helpful tips and tricks for tackling behaviors I yelled about this, a lot. Just leaving the seat up would be a welcome change at this point. Something I could never have imagined a lifetime ago. And while yelling, if you do enough of it, likely will work, it has to be one of the least efficient and most taxing ways of getting there, and it is accompanied by the potential for harm. But I’m not perfect either, and I yelled about pee on the toilet seat. Eventually he got it. Mostly. Now when I go to the bathroom and find pee on the toilet seat, I take a breath. And I ask myself if I think he has successfully NOT left pee on the toilet seat eight out the last ten times he went. If I think he’s succeeding at not peeing on the toilet seat 80% of the time I let it go. 6. Prep work. This summer has been amazing. My kiddo attended basketball, tennis, art & piano. His nanny is a childcare goddess that has kept him moving. He has had a licensed, district provided home instructor. But that can be a hectic schedule. He wants to know, always, when is there time for Minecraft. We took a giant office calendar and we filled it out so that every day he could look and see when his teacher was coming, when the nanny was coming, when his classes were, and any other planned activities. We also talk about new situations and discuss expectations before going in. One clear way to communicate what’s coming is first then statements. First we do this non-preferred activity, then we do this preferred activity. 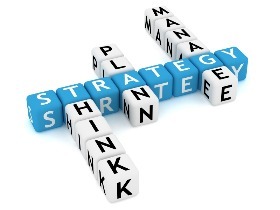 7.Manage transitions in the least traumatic way possible. Transitions are hard for kids with many different kinds of disabilities. This is a big problem that leads to countless meltdowns. But this is one trick can dramatically alter those situations. Timed warnings, that’s it. Leaving the beach? I give him a 15 or 20 minute heads up. Then I set an alarm for 10 minutes, and let him know. Then five more minutes. Depending on your child, and their age, you might have to fiddle with the length of time you give for warnings that work for your kid. Use your cell phone alarm, that will also take some of the responsibility for ending things off your shoulders because the alarm said we need to move on. Even better if you can tell your child what time you are going to leave before you even get there. 8. Use trigger words. As we have been learning, navigating and eventually successfully implementing this “token economy” technique, we’ve learned that we can motivate the intended response by using trigger words. At first we worked on accepting no for an answer, so that one was easy, NO. Then we began to work on following instructions. Something had to notify him that hey, he had been given an INSTRUCTION and whether or not he followed it was going to affect his points earned towards the reward. He had used yes sir or ma’am in the past for karate instruction so it already was a click word for us. You can use whatever works for your family. 9. Give binary choices. These kids feel like they have very little control over their lives. They can’t even control their own emotions. Find the things that you really don’t care about but that might mean a lot to your kid and let them choose. Don’t overwhelm them, again this is extra hard for a kid with emotional regulation issues, and they still very much need your guidance. Things like asking which of these two clean and appropriate tee shirts would you like to wear, which chore would you like to do first, even what would you like for dinner when you and your spouse can’t decide, this or that. Two choices. 10. Ignore him. That’s right, this is a legitimate technique. One of the most important lessons I have learned from reading parenting books was written in the book The Explosive Child by Ross Greene. Greene states that parents need not attend every argument they are invited to. Learning to pick your battles is pretty much the key to survival. If you want to justify this, apparently the pros call this “extinguishing techniques.” Sometimes giving the behavior attention will increase the behavior. I have no idea when that is versus when you need to meet their need for attention for YOUR child, there is nothing about this that is a perfect science. This is really a corollary philosophy to the good old fashioned time-out; it’s just the absence of positive reinforcement. Sometimes it’s a natural consequence. If my kid speaks to me disrespectfully well then naturally I don’t want to hang out with him or do something nice for him. We haven’t even gotten our behaviorist yet. But when I started to work with an autism framework, and learned some of these tactics, it changed our lives. Many of these we only figured out this summer and it feels like we have made more progress with my son in three months than the prior three years. This also only scratches the surface. There are so many tricks we can learn and use to help our special needs children to self-regulate their emotions, behave appropriately for life and treat us with a modicum of respect. I want to hear yours. Tell me in the comments, what behavior hacks help you to parent your child with special needs? I think we parents with special needs kids after a while all figured out these techniques. But we never put them in meaning terms and categorize it like this. Good for reference behaviors and give to those relatives who want to know more about your child!